We all love Febreze Air Freshener but it can sometimes be expensive. Why not make your own DIY Febreze Fabric Freshener and save some money! You may also be interested in How To Make Your Own 409 Cleaner. 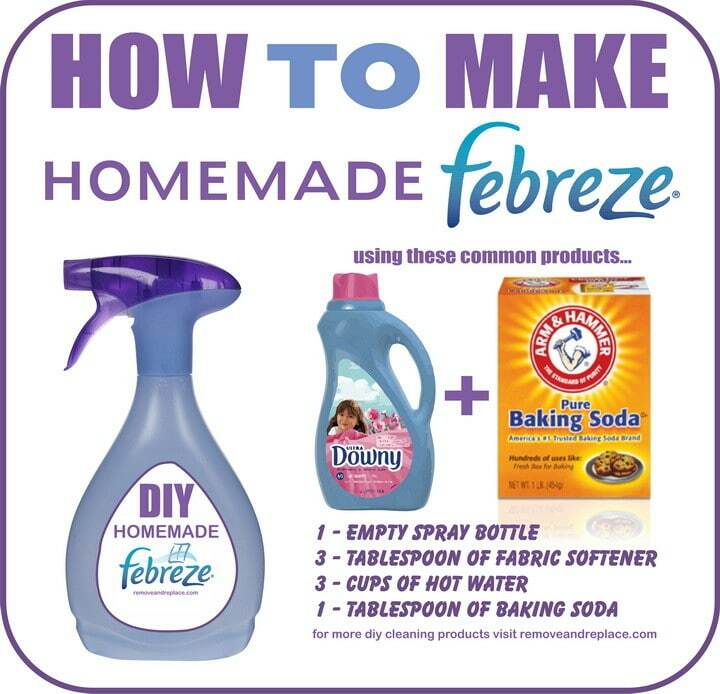 DIY Homemade Febreze is so easy to make and you will save some money too with this simple recipe. – First, add 3 Tablespoons of Fabric Softener (favorite scent of Downy or other) to an empty spray bottle. – Then fill the spray bottle with 3 cups hot water. – Now add 1 Tablespoon of Baking Soda. – Finally shake the bottle vigorously and spray on a test area to make sure it will not stain a particular area. This is AMAZING!!! !… I made this DIY “Febrezze”…OMG!!! !….It works!! !… My houses soo fresh!!! !… You have try this!! !… I bought a large size of dabric softener and will be able to make at least 15-20 bottles of spray…. You can only imagine the savings you will save doing this easy solution!!!!…. I have a scent allergy and I have found this works well with Borax which also is a fabric softener I can then control the scent with essential oils. Could also try pre-dissolving the baking soda (making sure to beat out any lumps) in a minimal amount of cool water before adding to the fabric-softener-hot water mixture. Maybe mix it in a blender first? it still works but does kill the spray mechanism. when ever I try this the baking soda always clumps. I have tried adding it to the hot water first, tried adding to the bottle after, tried adding to the bottle before the water. it always goes into lumps. any tips on stopping this? If the baking soda is lumping, use a little less and see if that eliminates the clumping issue.